The brakes are easily operated using a long brake handle and brake stopper which provides good leverage and is simple to brake even with weak hand strength. The Dolomite Maxi has a flip-up foldable seat that gives the user the room to stride out, making it easier to reach and access items on worktops etc. The Dolomite Maxi is safe when folding. The folding mechanism is positioned high up so to prevent the user losing balance. 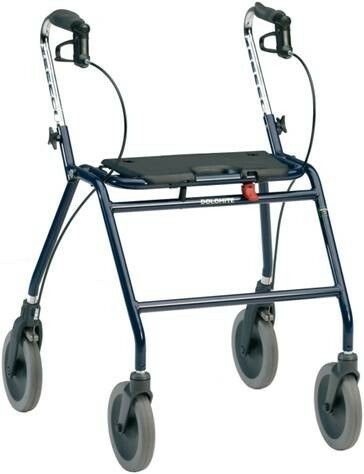 A magnetic safety latch prevents the walker being folded accidently. The frame is reinforced and can cope with a user weight of 200kg / 31st. 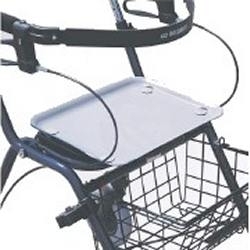 in addition the space between handle and wheel is 10cm/ 4 inches wider than standard. This means there is generous space for both walking and sitting. The large wheel base makes the walker extra steady and suitable for users with an increased need for stability.